I received these as an anniversary gift (5 years - flown by!) from the lovely Ms NLi10 as I often wax lyrical about the wonders of raspberries and white chocolate. I bought her some rose flavoured chocolates a while back (which I think I forgot to review) and these add that perfumed flavour into an already complicated mix. The question is - does this work? I think the answer is 'in moderation'. The wafer thin petals of chocolate are dainty and snap satisfactorily revealing little bits of raspberry while the rose oil appears to be swirled within the chocolate and so each bite has variations in the flavours. A single petal really is enough to get a good hit of the taste though and eating two or three can leave your taste buds a bit perfumed. As an event chocolate like a dinner party or as a gift these are perfect. They are something that shows a bit of thought and ideal for sharing in a small group (you maybe get 12-15 of the petals in the little bag). I think if you could find these for mother's day or for a loved one then they will go down perfectly. 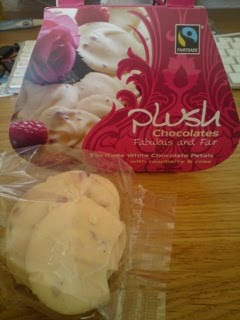 As it looks like this is a Fairtrade choc brand I may have to explore to see if they have any other interesting combos. I tried these and found them quite sweet, i agree that you can only eat them in small quantities i think. They do some strawberry and geranium ones as well ,if youre a fan of turkish delight flavoured things? Not sure how well geranium goes with chocolate, but I do like my Turkish Delight so would give them a try.